With less than a week to go until Samsung officially reveals its Galaxy S10 series of smartphones, leaks regarding the device continue to drop at a fast pace. 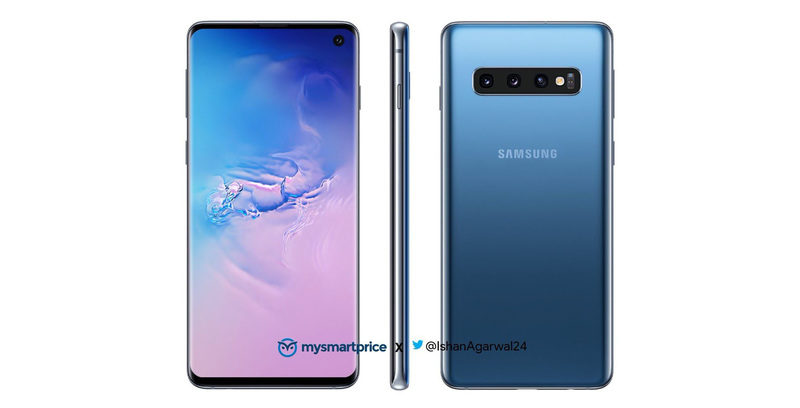 The latest is a new, leaked render that gives us a glimpse at a blue variant of the S10, and that also confirms that the smartphone is set to feature a standard 3.5mm headphone jack. The image, courtesy of MySmartPrice and Ishan Agarwal (@ishanagarwal24), seems to be an official Samsung render. It’s unclear what the official name of the hue will be, though Samsung called the blue Galaxy S8 ‘Coral Blue,’ with the Note 9 adopting the ‘Ocean Blue’ name. It’s likely this blue variant of the S10 will make its way to Canada. But it’s important to keep in mind that Samsung often has regional exclusivity when it comes to the colour of its smartphones. Over the weekend prolific leaker Evan Blass also tweeted out images of the Galaxy S10, S10+ and S10e in ‘Prism White,’ ‘Prism Green’ and ‘Prism Black,’ giving likely our best look yet at Samsung upcoming S10 series of smartphones.